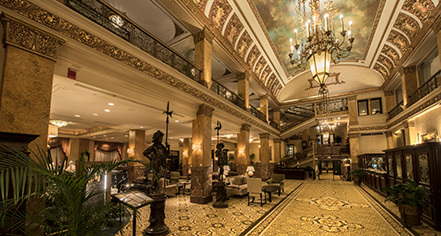 Dubbed the "Jewel of Milwaukee," The Pfister Hotel boasts ultimate luxury accommodations in the Midwest, distinguished by its fine hospitality, ornate Romanesque Revival architecture, and rich historic significance. Built in 1893, this premier downtown Milwaukee establishment has welcomed guests to its unrivaled splendor for over a century. Affording exceptional dining, 25,000 ft2 of opulent meeting space adorned with luminous chandeliers and marble accents, state-of-the-art amenities, and 307 thoughtfully-appointed guestrooms and suites, many featuring panoramic views of the vibrant city scape and wondrous Lake Michigan, The Pfister Hotel seamlessly blends its treasured history with modern conveniences. Holding the largest hotel collection of Victorian art, The Pfister Hotel lends a passionate ambiance that celebrates art, culture, and history through its unique creative programs, including The Pfister Narrator and Artist in Residence. With its treasured past and acclaimed luxury, The Pfister Hotel's extraordinary tradition of unrivaled service and elegant style continues to deliver a time-tested indulgence with a gracious warmth. 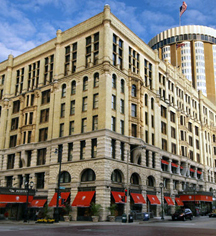 The Pfister Hotel, a member of Historic Hotels of America since 1994, dates back to 1893. Charles Pfister's passionate collecting created what today remains the world's largest hotel collection of Victorian art. Cancellation Policy: Cancellations must be made by 3:00 p.m. the day before arrival. Deposit: $40 deposit per day required at check-in. Early Check-In/Late Check-Out: Complimentary early check-in based on availability. Late check-out complimentary until 3:00 p.m., $50 fee between 3:00 p.m. and 5:00 p.m., with any checkout after 5:00 p.m. being charged for the next night. Subject to availability. Extra Person Fees: $20 for each additional guest over two (2) people. Hotel/Resort Fees & Taxes: All reservations are subject to a tax of 15.1%. Occupancy Restrictions: 2 guests per room standard; maximum of 4 people per room. Parking: Self-parking: Available; $27 per night. Valet parking: Available; $30 overnight. Pet Policy: Service animals allowed: Yes. Pets allowed: Yes. Amenities: Gift basket included in package. Services: Rover-Night Package Restrictions: Dogs and Cats Only. Maximum weight: 75 lbs. Fees: $100 cleaning. Includes donation to Elmbrook Human Society. Smoking Policy: Non-smoking rooms; outdoor smoking only. Learn more about the History of The Pfister Hotel .